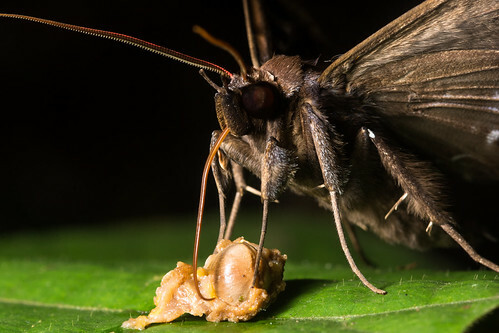 This moth sucking the nutrients out of a partially chewed up seed caught my attention. Earlier in the day some mystery critter had encountered a bit of fruit in the canopy, perhaps it was a monkey or a squirrel or maybe some sort of bird or something else, we will never know, but while it was snacking on fruit it dropped some mangled bits down to the understory where they did not go to waste either. Various invertebrates flock to the smaller bits as a source of a nutritious meal. Larger fruit is consumed by various mammals such as the bearded pig, muntjac, sambar, and mouse deer.